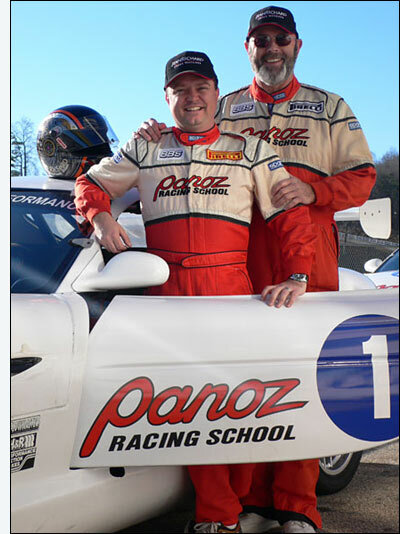 Culminating its “Watch, See and Win” promotional program for 2006 (announced here), JEANRICHARD Swiss Watches recently brought its contest winners to Road Atlanta for a day-long session with the Panoz Racing School. Don Silliphant from San Diego was the contest’s grand prize winner. He’s a retired teacher and fireman. He was accompanied by Barney Hill, owner of Leo Hamel & Co. – a watch and jewelry retailer with stores in San Diego and Solana Beach, Calif. – and Dano McCarthy, an estate buyer associated with Leo Hamel & Co. The promotion provided anyone who buys a JEANRICHARD timepiece during the promotional period and in the U.S. at an authorized retailer two free tickets to a 2006 American Le Mans Series race of their choosing and a one-year subscription to bi-monthly magazine Auto Aficionado. In addition to the session at the Racing School, the winners also received a three-day, two night stay at Chateau Elan Winery & Resort and a replica helmet of that worn by Autocon driver Chris McMurry during the 2006 American Le Mans Series season. “It takes a lot more focus and concentration than I ever anticipated,” Silliphant said, after his on-track period at Road Atlanta. “It was a humbling, and exciting experience all in one thanks to JEANRICHARD and Leo Hamel & Co."
“The amazing thing is how much the car can handle versus how much I could handle. Turn 12 is a real eye opener!” echoed Barney Hill. All this was pleasing to the ear of Ron Jackson, president and CEO of JEANRICHARD, the Official Timekeeper of the American Le Mans Series and sponsor of the Autocon Motorsports Lola that races in LMP1. An announcement regarding JEANRICHARD’s future plans with the Series will be announced in the very near future.